Why Children that Have Been Recently Vaccinated with Live Virus Vaccines (Such as MMR) Should be the Ones that Are Isolated (Rather than the Healthy Unvaccinated Ones) But should they be arrested if they are found at the mall? Just like people with viral infections can shed and transmit wild-type virus, 86 people given live virus vaccines can shed and transmit vaccine strain live attenuated virus. 87 Like wild-type virus, vaccine strain live virus can be shed in body fluids, such as saliva, 88 89 nasal and throat secretions, 90 breastmilk, 91 92 urine and blood, 93 94 stool, 95 and skin lesions. 96 Shedding after vaccination with live virus vaccines may continue for days, weeks or months, depending upon the vaccine and the health or other individual host factors of the vaccinated person. Following two decades of repeated child vaccination campaigns using OPV (oral polio vaccine) in India, the World Health Organization in early 2014 pronounced India “free” of wild-type polio. The controversial declaration comes at a time when India has been experiencing a huge increase in reported cases of non-polio acute flaccid paralysis (NPAFP). In 2004, 12,000 cases of non-polio paralysis were reported but that number had increased by 2012 to 53,563 cases for a national rate of 12 per 100,000 children. Two pediatricians in India compiled data from the national polio surveillance project and discovered a link between the increase in OPV use among children during stepped-up polio eradication campaigns and the increasing cases of NPAFP among children. In one study, MedImmune reported that after FluMist vaccination 89 percent of babies between six and 23 months of age shed vaccine strain live influenza virus and 20 percent of adults between 18 and 49 years old shed vaccine virus. Vaccine-strain virus shedding reached a peak between two and three days after FluMist was inhaled and shedding was generally finished by day eleven. A 2011 published study of children aged six to 59 months in a daycare setting found that most of the children given trivalent live attenuated influenza vaccine (LAIV) shed more than one vaccine virus within 11 days of vaccination. In the 2013 RotaTeq product information insert, Merck reported that vaccine-strain rotavirus shedding was documented in the stool of 32 of 360 (8.9 percent) patients following one dose of RotaTeq and appeared as early as one day and as late as 15 days after vaccination. Measles virus is a paramyxovirus, genus Morbillivirus with a core of single-stranded RNA. It is rapidly inactivated by heat and light and has a short survival time (less than two hours) in the air or on objects. Measles is highly contagious and causes a systemic infection that begins in the nasopharynx. The virus is shed through respiratory secretions (nasal discharge, coughing sneezing) for four days before symptoms appear until three to four days after rash onset, when it is most easily transmitted. The incubation period from exposure to symptoms is 10-12 days and symptoms start with fever, cough, runny nose, conjunctivitis, white sports in the mouth and progresses to a rash that starts on the face and spreads to the rest of the body and lasts for about a week. Complications include very high fever, diarrhea, otitis media, seizures, pneumonia, encephalitis (0.1% reported) and very rarely subacute sclerosing panencephalitis (SSPE) and death. “Measles inclusion body encephalitis (MIBE), pneumonitis and death as a direct consequence of disseminated measles vaccine virus infection have been reported in immunocompromised individuals inadvertently vaccinated with measles-containing vaccine;” although Merck also states that “Children and young adults who are known to be infected with human immunodeficiency viruses and are not immunosuppressed may be vaccinated” and that “The ACIP has stated that “patients with leukemia in remission who have not received chemotherapy for at least 3 months may receive live virus vaccines. There have been published reports of vaccine strain measles with clinical symptoms that are indistinguishable from wild-type measles. There are also a few reports of measles vaccine strain virus shedding and lab confirmed infection in children following MMR vaccination. In 2010, Eurosurveillance published a report about excretion of vaccine strain measles virus in urine and pharyngeal secretions of a Croatian child with vaccine-associated rash illness. A healthy 14-month old child was given MMR vaccine and eight days later developed macular rash and fever. Lab testing of throat and urine samples between two and four weeks after vaccination tested positive for vaccine strain measles virus. Authors of the report pointed out that when children experience a fever and rash after MMR vaccination, only molecular lab testing can determine whether the symptoms are due to vaccine strain measles virus infection. They stated: “According to WHO guidelines for measles and rubella elimination, routine discrimination between aetiologies of febrile rash disease is done by virus detection. 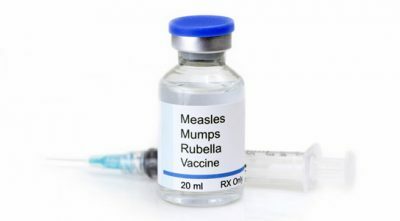 However, in a patient recently MMR-vaccinated, only molecular techniques can differentiate between wild type measles or rubella infection or vaccine-associated disease. This case report demonstrates that excretion of Schwartz measles virus occurs in vaccinees.” In 2012, a report was published describing a healthy 15-month old child in Canada, who developed irritability, fever, cough, conjunctivitis and rash within seven days of an MMR shot. The case involved a two-year-old child, who developed runny nose, fever, cough, macular rash and conjunctivitis after vaccination and tested positive for vaccine strain measles virus infection in throat swab and blood tests. Canadian health officials authoring the report raised the question of whether there are unidentified cases of vaccine strain measles infections and the need to know more about how long measles vaccine strain shedding lasts. Vaccine manufacturers and the medical community caution susceptible individuals, including pregnant women, newborns, and those with a compromised immune system to avoid close contact with anyone who has been recently vaccinated with either live varicella zoster (chickenpox) or herpes zoster (shingles) vaccines. There is no active surveillance of live virus vaccine shedding and most vaccine strain virus infections likely remain unidentified, untested and unreported. The risks associated with exposure to someone vaccinated with one of the live attenuated vaccines can be greater or lesser, depending on the vaccine and the general health of an unvaccinated (or vaccinated) person. Some passively acquired immunity to vaccine-strain viruses may occur with widespread use of live virus vaccines in populations but it is unknown how long that immunity lasts. It is also not known how many vaccine strain infections, which occur in vaccinated persons or close contacts, lead to chronic health problems or even death. The development of experimental genetically engineered live virus vaccines and virus vectored vaccines, especially those that are being “fast tracked,” have the potential to cause unknown negative effects on human health and the environment. There is a vacuum of knowledge about the potential of live attenuated and genetically engineered vaccine viruses to mutate and recombine with other viruses and create new viruses that will cause disease or affect the integrity of the human genome, human microbiome and healthy functioning of the immune and neurological systems. The impact of vaccine-strain virus shedding infection and transmission on individual and public health is a question that deserves to be asked and more thoroughly examined by the scientific community. The fact that children and adults given live virus vaccines have the potential to pose a health risk to both unvaccinated and vaccinated close contacts should be part of the public conversation about vaccination.